Returning home to Japan after a long journey abroad, I felt the power of the touchstones of GENKI that help give energy and peace of mind and vitality to most Japanese people. GENKI is all these, and it is a vital force in the Japanese sense of well-being. GENKI is a state of being healthy, energetic, vibrant. Symbols of GENKI, while origins and meanings are lost in the tides of time, are everywhere and even if they are little noticed, somehow they do communicate Energy and Good Fortune. 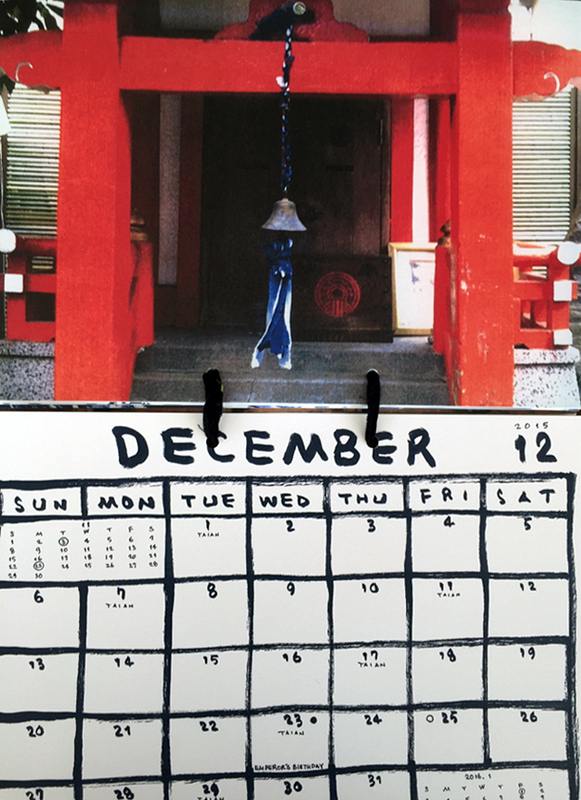 The Tori no Ichi Festival of November features bamboo rakes with symbols of good fortune. The gigantic one hung high from the rafters of Ueno Station greets visitors coming and going. 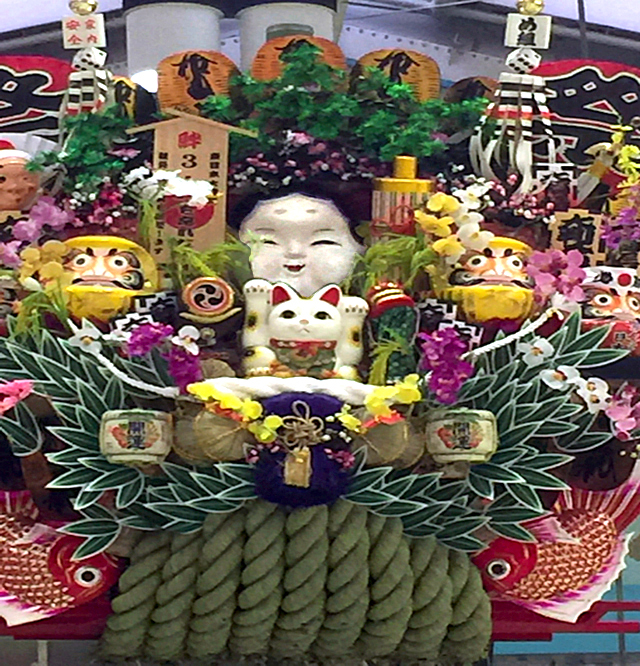 Just making such a huge decoration, and hanging it high over peoples’ heads as they arrived and departed from the station left them with a jolt of GENKI and many stopped to take photos of the gigantic monument to GENKI and Good Fortune. Matsuri or Festivals abound in the autumn and their shows of super energy reassure people that traditions prevail and give GENKI in full measure. 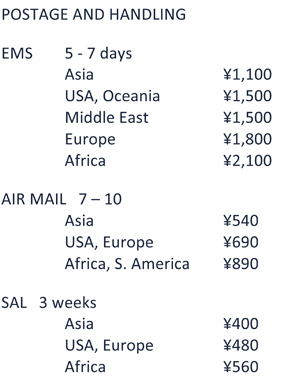 I feel a surge of GENKI in other places as well. 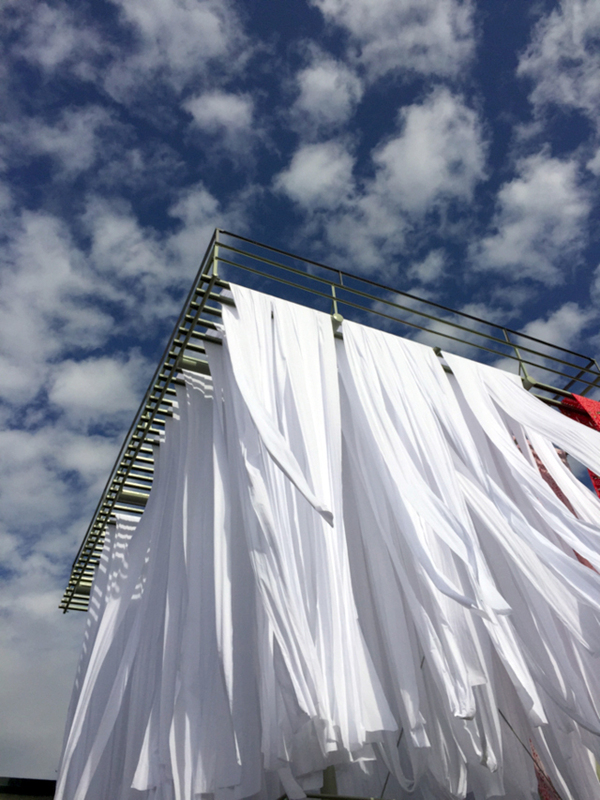 The sight of long bolts of flapping white cotton cloth drying in the autumn sun against a brilliant blue sky mottled with shibori clouds make me rejoice in the work I do. 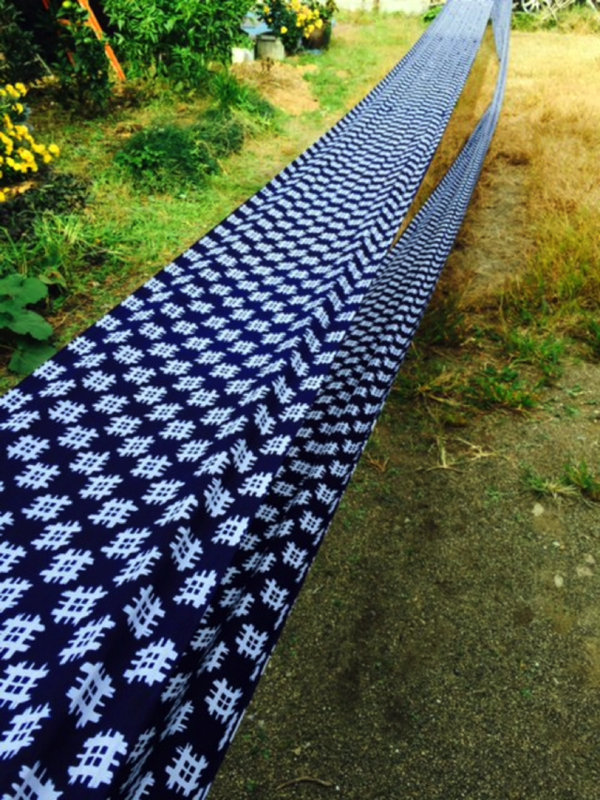 In the yard below, long stretches of stencil dyed kasuri patterned yukata are strung from one side of the yard to the other at Asahi Senko Dyeworks in Takenozuka in eastern Tokyo. The GENKI of blue and white! The power of the countless pairs of hands that worked together to put pattern to yukata! Nor can we forget the GENKI that comes from the bath – In this case a wooden tub. A heavenly host of energy splashing Otafuku – 100 at least! – are surely laughing and giggling as they soak. Laughter too is an indispensible source of GENKI! 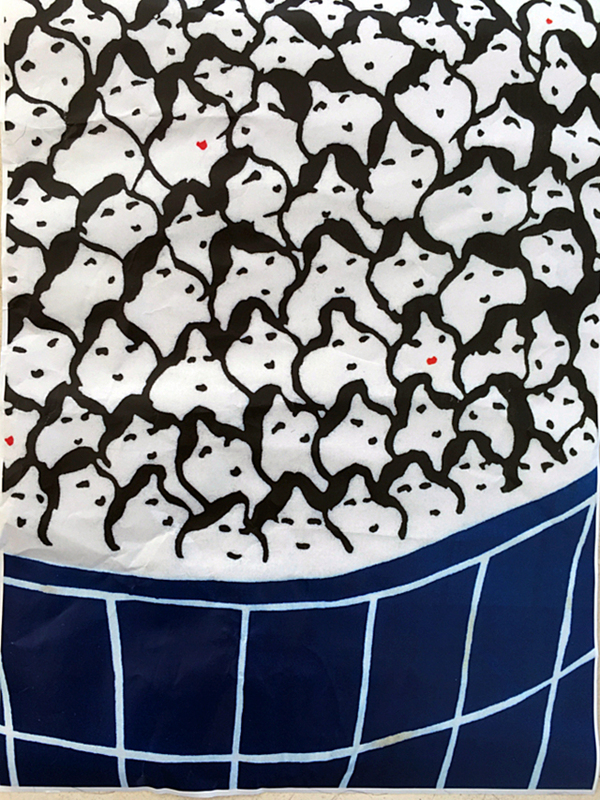 Close up of a Blue & White original tenugui. 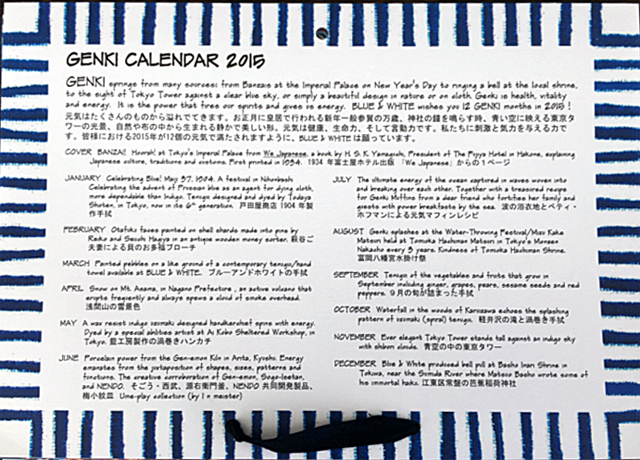 The 2015 Calendar is all about GENKI. Celebrating 13 of the many forms it takes. 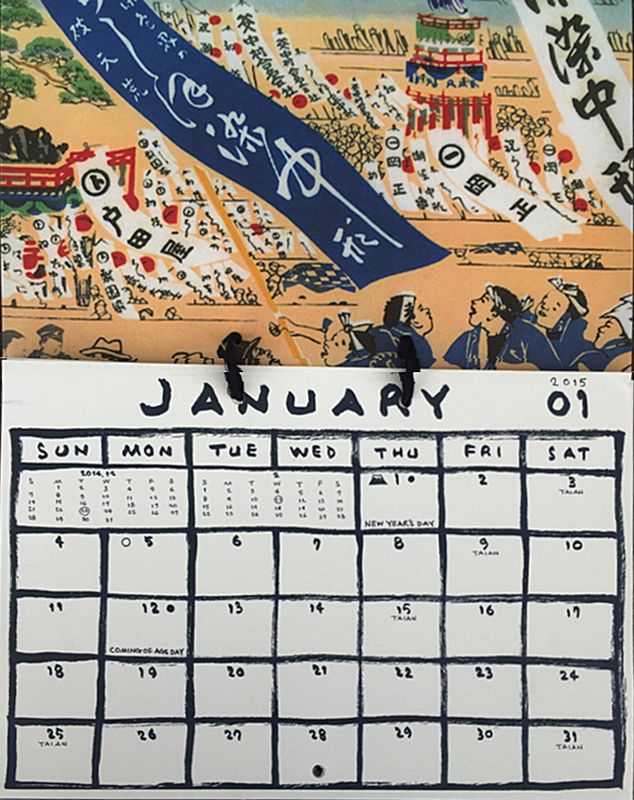 The cover is a 1932 version of crowds celebrating the New Year at the Imperial Palace in Tokyo. GENKI is contagious and eternal. 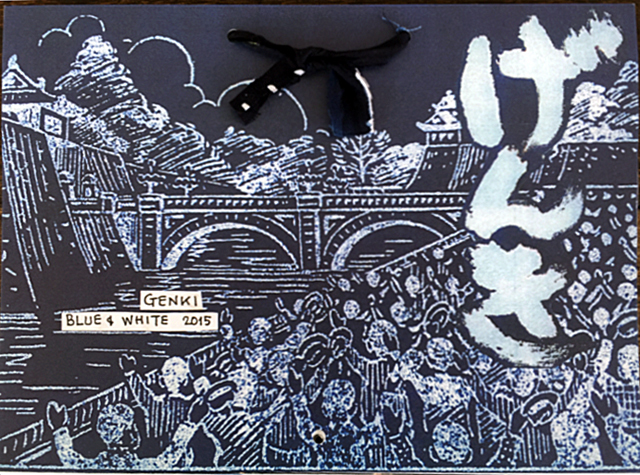 Celebration of the coming of Prussian blue to Japan depicted on a tenugui by Todaya Shoten. A festival that captur d the excitement of a new blue synthetic dye to replace the time-consuming and unpredictable indigo. 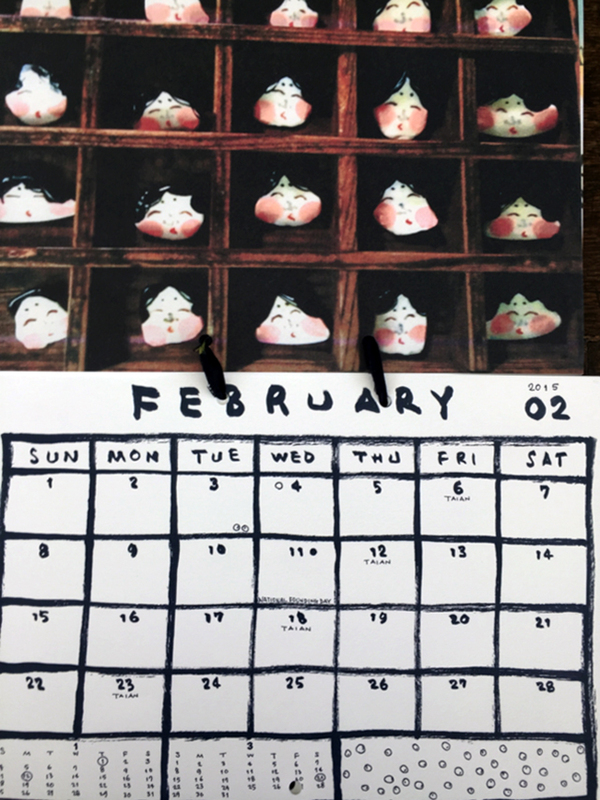 On the 3rd day of February, Setsubun is celebrated to mark the end of winter and beginning of spring . Beans are thrown outside to dispel the demons of evil and beans are thrown inside the house to welcome Otafuku, Blue & White’s smiling Goddess of happiness, good nature and jollity. Here her face appears on shell fragments brooches painted by Reiko & Seiichi Hagiya. Stones are eternal energy captured . Stacked one on top of the other, they are prayers in the Shinto religion. 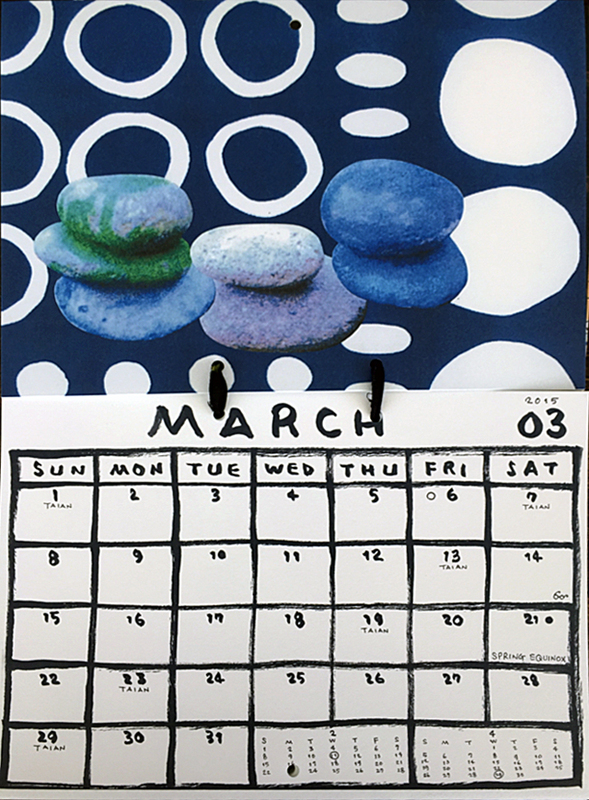 Here painted stones have been stacked and put together with a similar tenugui of circular forms. Nature is a constant inspiration in Japanese design. Mt. Asama is an active Genki volcano in Nagano. It is always crowned with a halo of smoke spewing from its crater at the top and climbers climb at their risk. 3 toppings of snow at its summit preclude the start of the winter of snow. 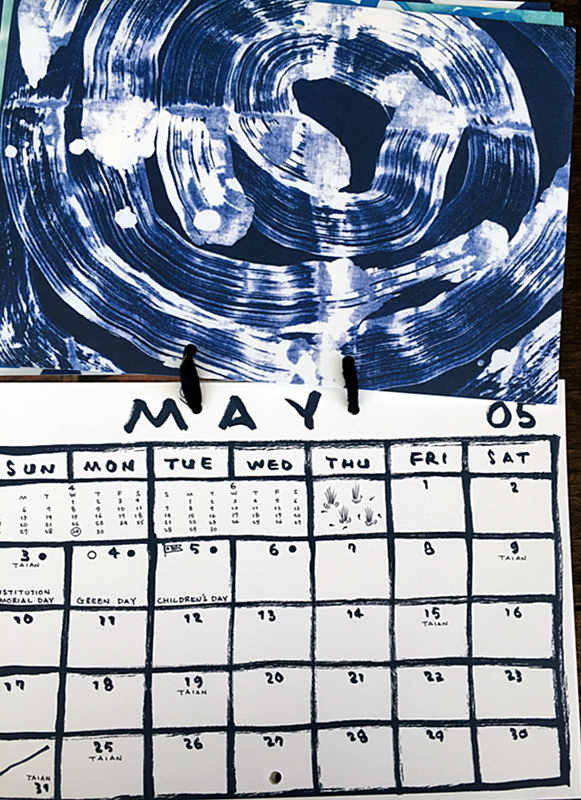 A whirling spiral of energy was created by one of the artists of Ai Kobo, an indigo dyeing workshop for Special Abilities artists. Wax resist on an indigo ground gives a power and Genki to both the cloth and the artist. Different forms and shapes and patterns are brought together by the combustion of blue and white, the cosmic color combination echoed in skies and clouds, seas and waves. Rivers and splash. 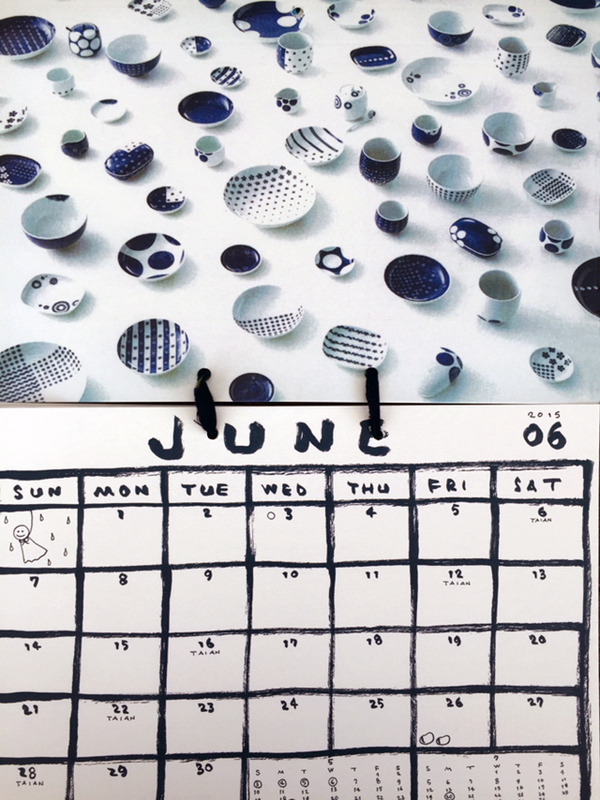 Blue & White is the eternal color combination powerfully juxtaposed here in a powerful composition of Genki . Kindness of the collaboration of Gen’emon kiln of Arita in Kyushu with Sogo-Isetan partnership and NENDO. Ume-play collection by I n meister. 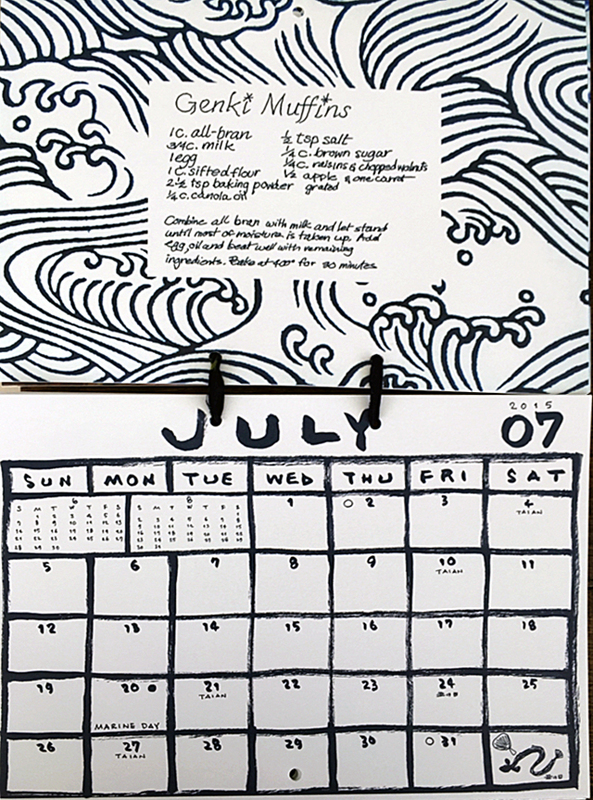 The ocean is the ultimate source of GENKI and what could be more empowering than Genki Muffins served in a beautiful kitchen by the East China Sea in Okinawa? 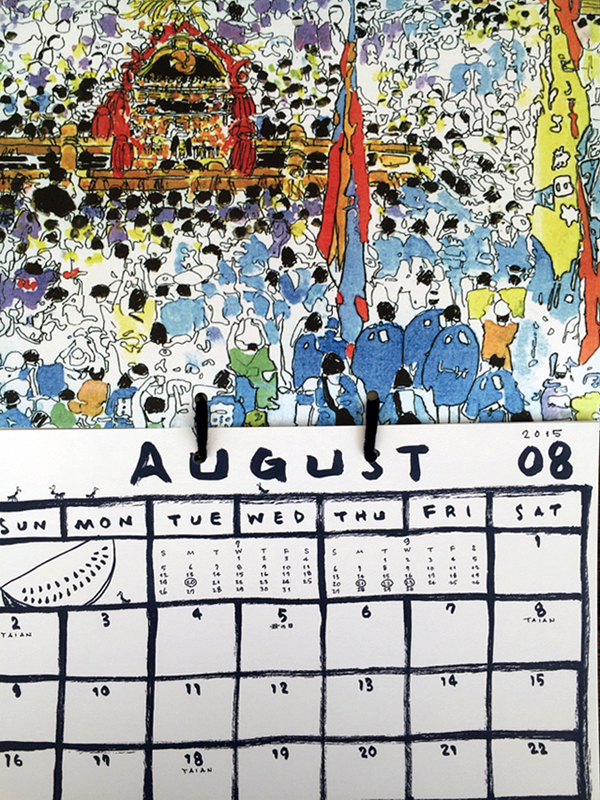 Summer matsuri under the swelter of the summer sun have an energy all their own. Courage and dash and bravado / machismo all are part of the Genki of the Mizukake Matsuri of Tomioka Hachiman Shrine in Monzen Nakacho, in Eastern Tokyo. Throngs of people splash water on the valiant young men who shoulder heavy portable shrines and shout encouragement as they parade through thestreets and across the bridges. Shun is the idea of vegetables pulled and picked fresh from the field and eaten in their moment of glory, bestowing their true flavor and energy. 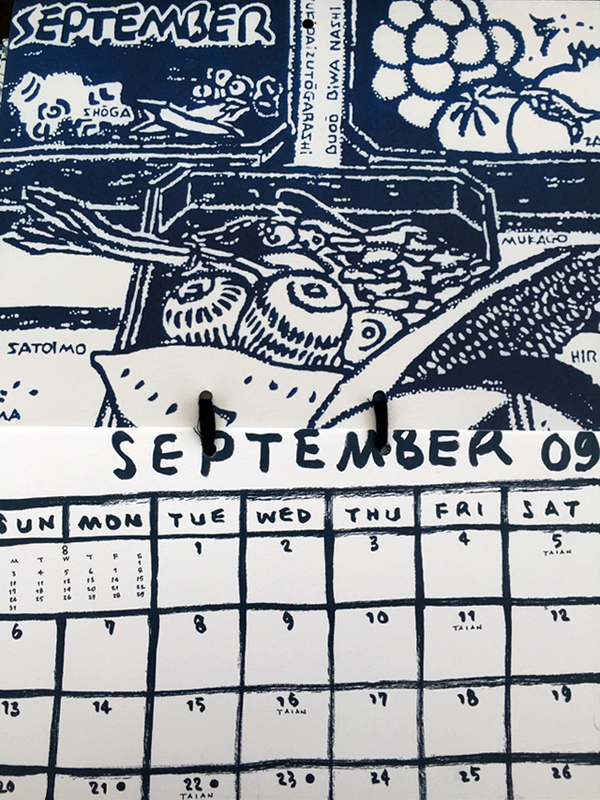 The vegetables that ripen in September have been researched and drawn on our 4 season tenugui calendar that celebrates the Genki of each month on cloth. 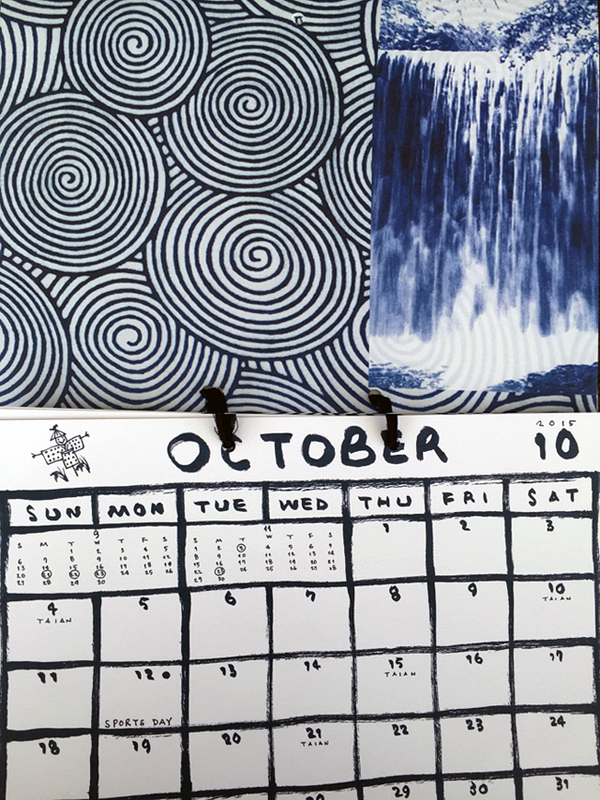 Swirls of energy captured on a spiraling Tenugui echo the power of a waterfall spilling down to a racing river in Karuizawa where our black dogs love to swim and retrieve sticks. 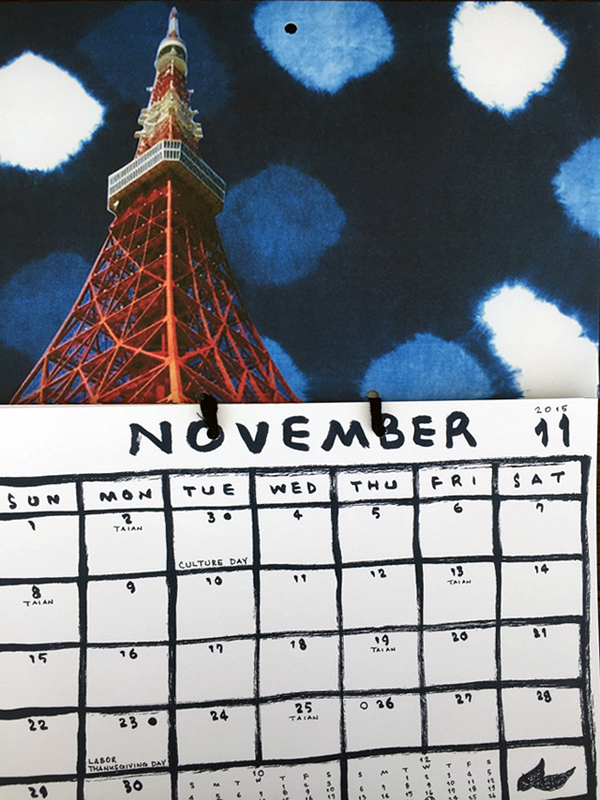 Ever elegant Tokyo Tower stands watch over the city, guiding the lost, and giving reassurance with its vibrant vermillion thrust of energy into an indigo sky studded with white shibori clouds. Basho Inari Jinja in Tokyo’s Tokiwa is a sanctuary for neighbors and haiku lovers as well. The bell pull made of cut ends of tenugui was braided commissioned and contributed by Blue & White. 1 Response to GETTING GENKI! 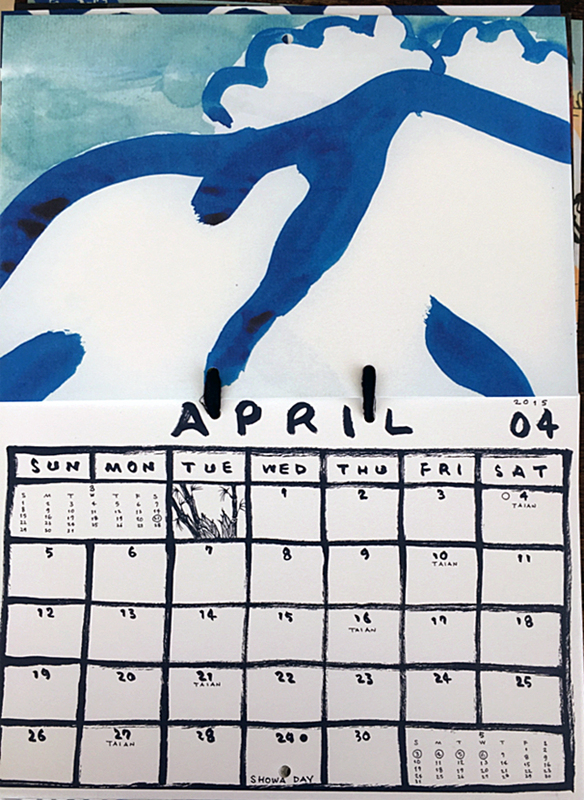 My calendars arrived today, thanks a lot. Beautiful!